During the summer, we partnered with our buddies over at Cotton+Steel for a fun substrate series and took an in-depth look at how to sew with different types of fabrics. We’ve decided to start an on-going fabric series that will teach you how to have the most successful experience working with individual fabrics. Today, I’ll discuss the nuances of sewing garments with quilting cottons. Quilting cotton is by far the most common and easily assessable fabric out there. They can be found at the “big-box” stores as well as the brick-and-mortar shops. Sewing garments with quilting cotton is a hot topic with many opposing views. Who knew such a simple fabric would become a sewing controversy? Quilting cotton is a fabric made specifically for, you guessed it, quilting. For many of us, our first garment was made of quilting cotton. For me at least, the multitude of fun prints on quilting cotton motivated me to start sewing in the first place. There are hundreds of companies producing quilting cotton and due to different manufacturing styles, quilting cotton does come in slightly different weights and drapes. Yes, you can use quilting cotton as apparel fabric. The main thing to remember is that quilting cotton tends to be crisper than apparel cotton. It isn’t particularly soft and has a stiffer drape. This fabric works best when made into structured loose fitting garments. It’s sturdy and holds up through many washings but may need to be ironed frequently. In general, quilting cotton looks best made into casual garments, with ample ease. Our friends over at Sprout Patterns offer cut-and-sew patterns that print the pattern and fabric design directly onto quilting cotton. They recently released our Aster blouse and I made my own Aster in a Spoonflower design I’ve been eyeing for quite some time. They offer a Basic Cotton Ultra and Kona® Cotton Ultra quilting cotton. I choose the higher quality Kona® Cotton Ultra for my Aster in order to have a lighter drape. You’ll find that sewing with quilting cotton is incredibly easy. It’s easy to cut, doesn’t slip and slide, and irons nicely. Which is why it’s so popular with quilters and sewers alike. Depending on the quality of your quilting cotton, it may shrink a considerable amount. We suggest pre-washing your fabric before cutting to ensure that all shrinkage is done before you start sewing your garment up. Use a gentle detergent that has no dyes or perfumes. If your washer has a second rinse cycle, take advantage of it to rinse out any extra dye or residue. Dry on cotton or “permanent press” setting. The Kona® Cotton Ultra from Sprout Patterns should be machined washed warm or cool on a gentle/delicate setting, using phosphate-free detergent and machine-dried using a low temperature or permanent press setting. The estimated shrinkage is 2-4% in length and 0-2% in width. Quilting cotton is quite sturdy. Generally, a hot, steamed press will work wonders and will not damage the fabric. Press with the printed side down, when possible, for better results. A rotary cutter and a cutting mat were originally made for cutting quilting cotton and this technique will make clean cutting lines and will save your joints. I choose to cut my Sprout Patterns fabric with scissors because it wasn’t necessary for me to lay the fabric flat. Chalk, transfer paper, and marking pens will all work well on quilting cotton. Whenever possible, mark on the wrong side of the fabric to avoid affecting the printed side. Fusible light weight interfacing works perfectly. The lightweight of quilting cotton does not lend itself to sewn-in or heavyweight interfacings. We recommend 50wt cotton or polyester thread. Polyester thread is stronger than cotton and tends to come in more colors. Sewing Note: For thread weights, a smaller weight number indicates a heavier thread. The weight of a thread is actually a length measurement. When 50 kilometers of that thread weighs 1 kilogram, it is a 50 weight thread. A 40wt. thread is heavier because it takes only 40 kilometers of thread to weigh one kilogram. You should choose your needle size based on the type and weight of thread that is being used as well as the fabric that is being sewn. Since quilting cotton is a mid-range fabric, we recommend using a Universal needle, 80/12. Quilting cotton doesn’t fray too much but raw edges should be finished in some way. For the best results, serge or use pinking shears to finish raw edges. Quilting cotton is generally used in more casual garments and fine seam finishes are not necessary. A 1″-2″ double turned hem is great for a garment made in quilting cotton. If your hem is too small it may turn up and not lay flat. Try a blind hem stitch rather than straight stitching your hem to elevate the garment a bit more. Opt for the 3 basting stitch lines when setting in sleeves. Quilting cottons don’t have much stretch on the cross grain and can be a pain to ease into tight quarters. The extra basting stitches will help you gather up the extra fabric in your sleeve cap for easier set-in sleeves. Add a lining in a lawn or voile to help your garment drape a bit better and be more comfortable on the skin. Do not be fooled by the structure of quilting cotton, it will most definitely stretch when cut on the bias. Staystitch right after cutting to avoid stretched out necklines! Quilting cotton prints are literally printed onto the fabric, therefore, your stripes may not actually line up the grain line of your fabric. Keep this in mind when pattern matching and cutting. Quilting cotton tends to have a good amount of body and doesn’t have a light drape like other lightweight cottons. In a loose-fitting garment, the fabric has room to move about rather than cling to the body. Simple details like darts and plackets will sew up nicely while fine details may be a bit tricky. 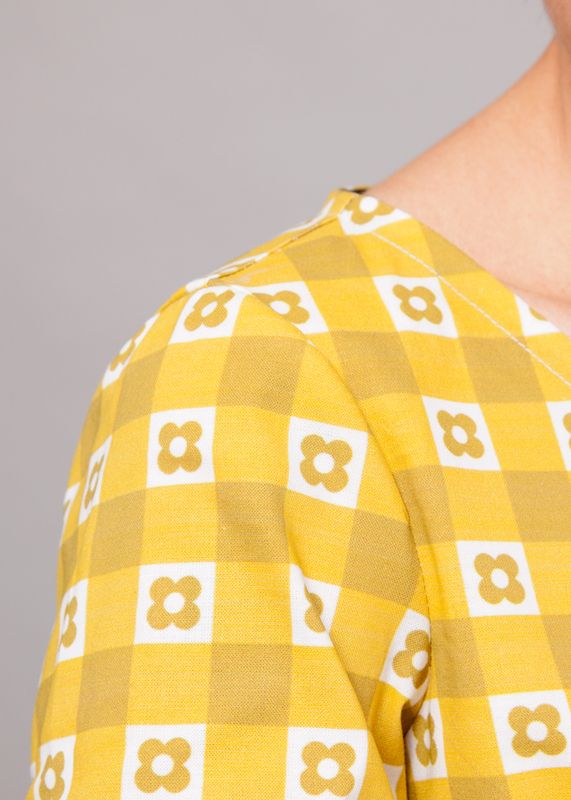 Try the Dahlia or Seamwork Mojave for for two totally different takes on the quilting cotton dress. The Aster was is perfect choice for quilting cotton because of it’s structured yet loose-fitting shape. A gathered or a-line skirt made in a quilting cotton will keep it’s fullness and will lay far enough away from the body to provide shape. Also, hemming quilting cotton is such a dream, it takes a press so well and your hem won’t shift around. The Zinnia and Ginger skirts are perfect for using cute quilting cotton prints. Pajamas and sleepwear are perfect for a fun quilting cotton print. After a few washes, the fabrics stiffness will lessen and will stand up to many a night lounging on the couch. The combination of the two are a perfect pair for any beginner sewers that are dipping their feet into garment sewing. The Seamwork Moji pants would make some real cute lounge pants for a cozy night in. Like Learning about different fabrics? We’ve got a great collection of fabric profiles on our blog. In celebration of Aster’s release, together with Sprout Patterns, we will be giving one lucky winner an Aster project. This giveaway includes one digital Aster pattern and your very own cut-and-sew Aster in any Spoonflower design you’d like! To take part in the giveaway, just comment below. On Friday, November 4th, we will announce the winner in our Sewing Chatter blog post. We’ll email you as well, just in case. Giveaway: Win 64 colors of cotton thread from Craftsy! I would love to sew the Aster as a Sprout pattern. I just ordered the Negroni for my husband off Sprout patterns and we had so much fun picking out one of the designs. I couldn’t afford smething for me this month, but I saw so many lovely designs (insert heart eyes here)! Don’t forget the 20% discount! COLETTELOVE on the Sprout site! Ooooh I’d love to win! But on to the topic at hand: what are your thoughts on using them for circle skirts? I know they aren’t bottom weight but sometimes they are just so pretty I can’t resist! Hey Carlee! Maddy at Miss Maddy Sews has made multiple circle skirts in quilting cotton and I think they turned out great! You can see some of them here. Thanks ladies! I made one before but didn’t staystitch the waist and after pfaffing about it had stretched out so maybe that is why I am still a little unsure of it. I love this fabric series. I always learn something new. It’s more up to date than books can be. Thanks for the tip about the 3 basting lines for the sleeve. I would love to make the Aster blouse! I’m just learning to sew so quilting cottons are perfect for me right now. I love this fabric it really pops. I have never heard of Sprout Patterns before, but I’m definitely interested after seeing how cute this top is. (fingers crossed to win). Sprout looks interesting! Asher looks good for breastfeeding too. Thanks! That’s really interesting–I hadn’t heard of Sprout but would love to give them a try. I love your posts on fabric, I feel like I’m learning so much from your blog and it’s making my clothes that I sew look 100 times better. Thanks! I really like quilting cotton for loose fitting t-shirts and skirts. I had been thinking about making a button up shirt with quilting cotton, but I was afraid it would be too stiff. After reading this I think I’ll try it. That Aster pattern looks like a great one to start with! Katie the shirt looks so cute on you! I’ve been wanting to try both Aster and sprout patterns! I know many sewers hate on using quilting fabric for garments so I like that this post shows off the advantages of using it for clothing. I have to admit im often inspired by Dolly Clackett’s predominantly quilting cotton self made wardrobe. Your Aster looks lovely. Great print and pattern combination. Thanks for the great article! I would love to win the Aster to try out the tips and tricks you wrote about. I’m still on the fence about using quilting cottons for apparel sewing…but I’m willing to give it another shot :) Thanksnfor the giveaway! I love the aster blouse! It’s one of the patterns that I kept checking back for almost every other day to see if it had been added yet! I’d love to try sewing up something from Sprout patterns. They look so amazing but are a bit of a splurge so i’ve yet to take the plunge! Great article with lots of useful info. I love your Aster! Love! I recently finished my first Aster… and then immediately made two more, because I loved the pattern so much. Checking out the Sprout options now, because that would make it even more of a breeze! Love this series. I’ve been wanting to try a shirt for myself and Aster would be fantastic. 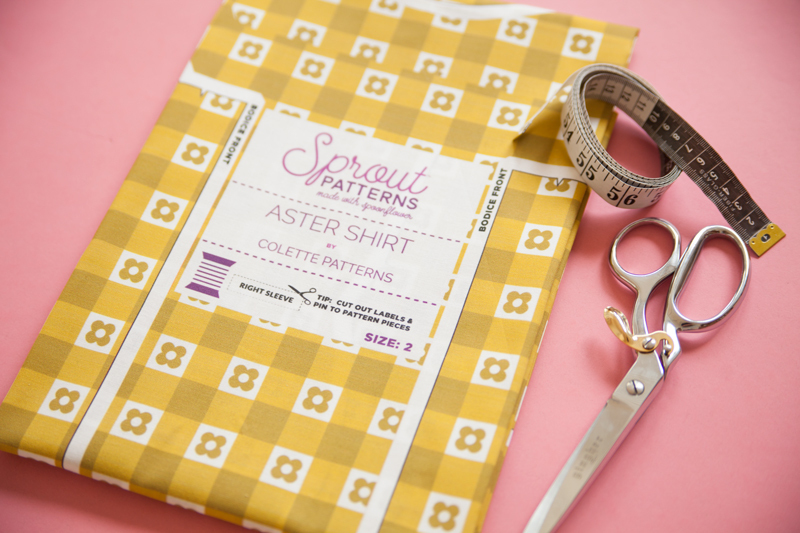 I would love to try out the Aster pattern and I’ve never tried Sprout. Thanks for the opportunity! I am going to start sewing with some lovely quilting cottons I bought, so thank you for this post! Ooh interesting, I’m curious about the Sprout pre-printed system. I’d be interested to give it a go! And also good note about the thread weights, I learned something new! Nice! I do love your patterns! And a Sprout cut and sew! Someone is going to be lucky! I did not see in the post if this fabric has been washed/shrunk, please clarify. Thanks for the giveaway offer. Oops. Additionally, how are alterations done. 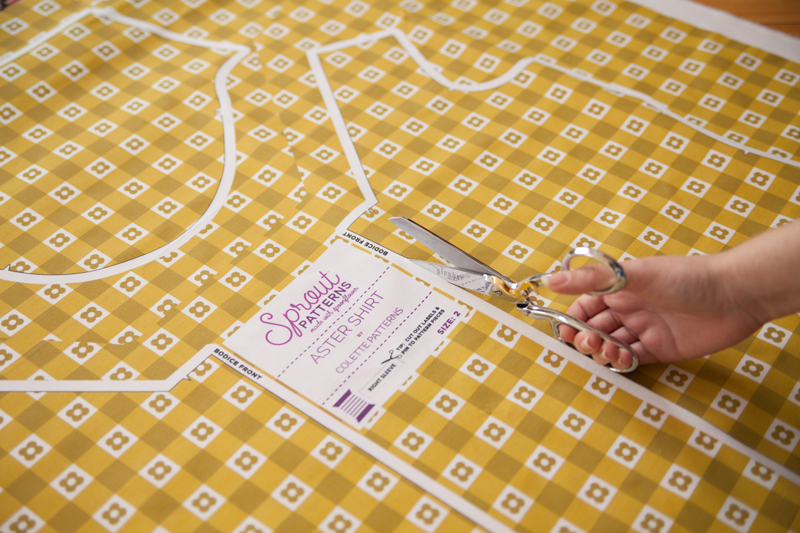 Do you alter the pattern digitally, manually and then print??? As for alterations, Sprout tries to choose patterns that do not require many alterations for most body shapes, but if you do need an alteration, try sizing up so you have more fabric to work with. I hope this helps! Thanks for all the info. I like using quilting cottons, mostly as the patterns are the best! Does anyone know if Sprout prints to ensure pattern matching? Hey Maryanne! It is not possible to match the pattern along the seams, or button placket in my case, as you can’t change the print placement for individual pattern pieces. Sprout does have a 3D preview that allows you to change the placement of the design. But, it’s only an approximation and does not reflect the exact print placement. This looks fascinating, but with the pattern printed onto the fabric, how do you make adjustments for better fit? Hello! There is a limited amount of adjustments you can make due to the current technology. You can always take things in and can do minor adjustments. For the patterns they offer, it’s usually enough to make it work. Holy cow, Sprout looks like a dream solution for me. I have such a laborious process of tracing my pattern of the factory sheet, then outlining on fabric, THEN cutting. Thanks for the coupon! Me loves your Aster! It looks so cute and comfortable and easy to sew! I haven’t sewn shirt collars or button plackets yet. I would really love to win! Quilting cotton is rare to come by in my neck of the woods. I love sewing with quilting cotton, it’s so easy to work with! I’ve had my eyr on the aster for a while, it looks versatile and cute/profesh depending on the fabric you choose and styling. I’ve also been curious about Sprout patterns for ages, but haven’t tried it out yet! 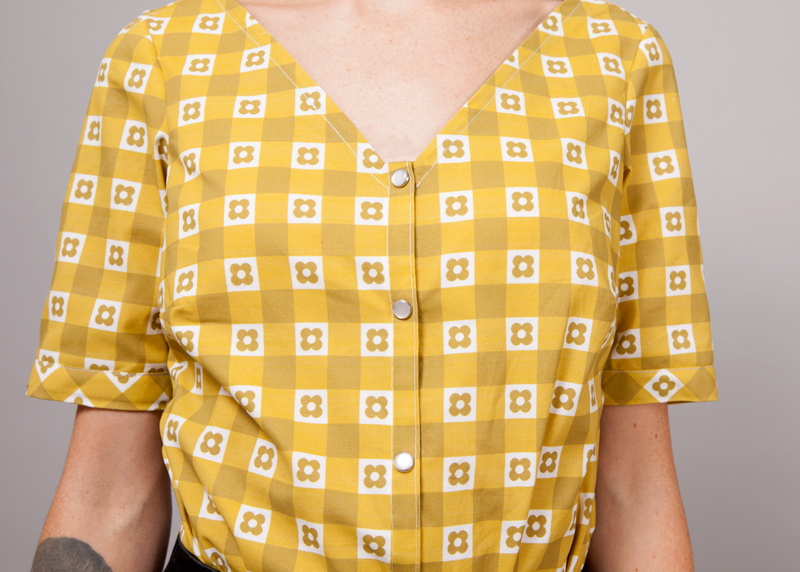 I’ve never made a blouse, and I think a Sprout pattern might be the way to start! This is a great idea for a series, I struggle to work out what fabric is best for a project. I vote you cover crepe next as I have a huge amount given to me by someone in my stash! I love sewing with quilting cottons, I find they loosen up a bit the more they are worn and washed. Plus, the extra stiffness is so helpful when sewing! This was an interesting read, and I’m glad other you will do a series on fabrics. Some great tips here that I hadn’t specifically thought about, but when I read the, I thought “of course, that is right/makes sense”!! Must try a Sprout pattern – the postage is a bummer for those far away though! I just finished a bomber jacket using japanese cotton quilting fabric. I think it’s fine to use this type of fabrics for tops, pajamas and kids clothing. If you like it why not? I’d love to try Aster! I’ve used other Collette patterns and I love Seamworks. Thanks for this series. Super helpful and interesting. I often use quilting cottons for skirts and tops. Like another commenter, sometimes I just can’t resist a beautiful fabric! I haven’t used sprout patterns yet but am getting ready to sew some spoonfllower fabric ! I haven’t used sprout patterns yet but am getting ready to sew spoonflower fabric. I’ve got the Aster pattern, but I’ve never used Sprout, so I’d love to try that. I love the double gauze fabrics! The draping is both soft and structured. A perfect 4 season fabric, easily layered in winter for extra warth outside, cool inside. I have been using quilting cottons for garments for years, but learned early on that prewashing is key. Thanks for the tip about hems! I make most of my scrub shirts for work out of quilting cotton, and the hem is one of the annoying issues. The other issue I have is the v neck band folding in the middle..
I’d love to try this! Any tips for avoiding option paralysis when using sprout/spoonflower? Oh, Thanks for the chance! I love your patterns, but haven’t tried the Aster yet. The Sprout pattern options sound really interesting! I love making quilts and dressmaking so I have a quilting fabric stash ready to hand at all times – though often in quantities too small for garments. Great idea to have the pattern printed on the fabric. I’ve had the Aster on my must make pile for a minute. Even higher now that I’m breastfeeding and it’s got great access. Spoonflower seems like a perfect new moms sewing reset button. Takes just enough work out of each project to get to the fun part. Really happy to have a post about project suitable for quilting cottons. That was something I really struggled with when I first started sewing. It’s always nice to have a little help getting the finished product you dreamed of after so much hard work. Thank you, this is so informative! I have always felt a little guilty using quilting cotton for clothes, but after this article I will let that go. I have never heard of Sprout before today. Thanks for everything! Quilting Cotton I find challenging to handle, my hands are sensitive to the touch of certain fabrics. Upon immediate contact/touch-test I can gauge the feel and drape to my body. I began using vinegar in my laundry upon multiple washing and I notice the quilt has noticeably felt softer and less stiff. Now, I am starting to feel better with quilt fabrics and would like to try some. I find that, in most cases, the better quality quilting cottons have a beautiful drape, are much easier to sew and don’t lose their brightness though multiple washings. They are more pricey, in many instances, but you get what you pay for! I’m a quilter, first and foremost, and I’ve never hesitated to use quilter’s cottons for apparel! I like the extra stiffness in the fabric; I once made a circle skirt that was so great because it had enough “substance” to hold its fullness through the entire day without wilting. Question: Finishing the edges–In what order do most people do this? I like a serged edge, and have seen the finishing done at all sorts of different times throughout the construction process. Some serge the pieces as a way to cut out the pattern pieces, some use the serger to stitch two pieces of fabric together, while others serge after everything is sewn up. Thoughts? this is such a great article. when I re-started sewing I knew nothing about quilting cottons except that was all I could find. They were beautiful, all cotton, and so much fun for children’s clothing. But I did wonder about their use for clothing. Now it is all explained. Thank you so very much. I just learned about Sprout a few weeks ago. very interesting concept for a unique design. everything is evolving in the world of sewing. Colette was the first place I went to for patterns. I like to wash quilting cottons at least two or three times before cutting and sewing, they can shrink quite a bit, and it can be helpful to relax all the fibers a bit before sewing curved areas. Mostly, I use them for children’s garments. Thanks for the tip Kathrine! very cool. sprout looks super neat! Would love to try the Aster pattern on spoon flower fabric. Thanks for the information. I’ve always wondered about the particulars of using quilting cotton for garments. Thanks for the tips! Great job on this guide for working with quilting cottons when making garments. It definitely helped me see it in a new light :) Thanks! I enjoyed reading your article. I love the variety of quilting cottons. It is more difficult to find a variety of apparel cottons. But are quilting cottondswide enough for a circle skirt? Thanks for the article! I made my adult daughter a lovely dress for a very casual summer wedding last year using quilting cotton. It was easy to work with and very comfortable for her to wear. What an awesome giveaway! Thanks so much f or your generosity! I wash my fabric before cutting, also, and have been using a vinegar rinse for quite some time. I find it helps to remove any lingering soap and dye, and the fabric feels softer as a result. I’ve never seen sewing patterns printed on fabric before, I guess the future is already there without me noticing! I would love to give this a try. I love Collette patterns and have a subscription to Seamwork. I have been teaching myself to sew over the last year and have made some decent garments so far. This would be an absolutely wonderful challenge should I win. I would love to sew an Aster in Spoonflower fabric – so many brilliant designs to choose from. I use quilting cottons all the time for sewing garments, but they’re always for my little girl, never for me. I’m not a big fan of how structured it can be on adult clothing, but it is perfect for little dresses and blouses… and the prints are always so darling! In my book, quilting cotton is the very first indication that a garment is self made. Unsophisticated is the term that comes to mind. They are great for children’s or teen clothes with the cutsie prints. I have a personal rule for any fabric/pattern choice: would I ever, ever see this on a professionally made garment in a store? If the answer is no, I keep looking. I think you have covered all the bases here…quilting cotton is easy to find, easy to sew and can be used for so many different garments. My favourite thing about quilting cotton is the variety available, there’s something for everyone. You can use it for pockets in your jeans, a bias binding to finish a neckline, the possibilities are just about endless. Sometimes I buy it just because it speaks to me. YAY, more substrates! I was totally fascinated with the substrate series Colette did with Cotton + Steel. The new partnership with Sprout is incredible and I can’t wait to get my hands on something totally unique! Of course, I’d love to win! I own the Aster, but haven’t seen it up yet. I just bought it at the local fabric shop! I’m thinking of using a Monaluna quilting cotton poplin for a jacket that’s lined and underlined with acetate and lambswool, respectively. I think it’ll be a gorgeous lightweight jacket! I may even wax the cotton to add a little rugged-ness and waterproofing. Thinsulate may work well as an underlining, but I’m in love with lambswool!!!! I bought the hubster Albion and bought the outer fabric, wool lining, otter wax for the outer fabric, and a gorgeous silk for the sleeves. Sadly, the hubs wants a collar, maybe mandarin, and I can’t draft one. HELP!!!! *sewn it up yet. Dang autocorrect! Three huzzahs to quilting cotton sewing! I’m currently in a vintage phase – one of the main reasons I taught myself to sew; ready-to-wear retro and vintage clothing is really too dear for my pocketbook! – and circle skirts are just perfect for the stiffness that quilting cotton affords. I’ve not had much luck sewing tops with it, though, so perhaps, if I win this giveaway, the Aster blouse will help turn my luck around. I love the idea that you are going to feature different fabric types! And I was just about to launch into making my husband a new shirt using a quilting cotton that he found for himself in a quilting shop in Livingston, MT. Thanks for all you info. Quilting cottons vary in weight and drape like paper to cardboard to plywood; they run a wide gamut. Cotton and Steel, as well as Tula Pink, make some of the softest and best draping cottons ever. I do a lot of sewing with Spoonflower fabrics, and the cotton printing quality has much improved with the Ultra process. That said, the Basic Cotton ultra has a much nicer hand for blouses than the Ultra Kona, which is still aping a homespun feel (and doesn’t soften up as much in the wash). For my money, the sateen is the king (soft hand, images are crisp and hold up in the wash over and over again), and it’s 54″ wide which is a bonus if you’re just printing the yardage. Spoonflower has worked really hard to address their printing troubles over the years; the fading isn’t as bad, the Ultra prints dark colors better, the crocking is minimal and the range of fabrics is impressive. If you tried them before and found them lacking, you might consider them again. Thanks for the article on fabrics! I’ve just gotten back into sewing after being away for 15 years or so and it’s amazing how much fabric has changed! This series is so helpful! Thanks especially for the “warning” that stripes may not be on grain. It’s nice not to learn that lesson the hard way. You suggest a voile or lawn lining? When I’ve done that in the past the lining stuck to my skirt, I’d recommend a more slippery, non-static lining like Ambiance Bemberg. Looking forward to reading and learning more! Thanks again. As a quilter I have some fabric ready to go, thanks for the inspiration. However I’d still be thrilled to win the contest! I absolutely despise easing sleeves into anything, but I’m going to try the three rows of basting – thanks for the tip! I’m interested in the cut and see giveaway too! I’ve never done a project like that before. I am just finishing up my first Aster blouse (in a double gauze) and I’m intrigued to see how the two fabrics compare. Thank you for your generosity! Yes! Would love to have my name entered to win! Love sewing with quilting cottons. Curtains pillows bags… Oh my. I love the prints available on quilting cottons! I love this article! I have a tendency to avoid quilting cotton for garments because of previous bad experiences. Now I know I can use all the fun colors and patterns! Also, how would a quilting cotton work for a negroni pattern? The Negroni looks great in a quilting cotton. Sprout offers the Negroni as well, check out the photos they’ve got on their site. I have been eyeing up the Aster for quite some time. I have also been very intrigued with Sprout Cut-n-Sew but haven’t tried it yet. What a great combo it would be to win!! I usually reserve quilting cottons for kids clothes and bags; however, I would love to give this aster a try! Thank you! I’d love to have the opportunity to try something from Sprout! I love to sew with quilting cottons because you can find so many fandom prints! My first garment was in a quilting cotton too! Thanks for this post, super helpful! And that shirt is hecka cute! I sewed my first Laurel 2 months ago in quilting cotton and I love it! I can’t wait to make more. Thanks for the article and giveaway! I love making gathered skirts in fun quilting cottons. I like having the option to use them. Thank you for the great info on quilting cottons and how they can be used in clothing. Loved this post and the aster pattern! This post is so helpful since I am fairly new to sewing!! I love the idea behind Sprout. Preparing and transferring the pattern is my least favorite part! What a great idea. I’d love to win a pre-printed pattern. Takes care of a lot of the work. Are the plaids already pattern matched. It looks like it in the sample. Been looking forward to try the Aster. Real nice example! I’ve been wanting to try a sprout project for a while! I’ve been a quilter for many years and am just now getting back to garment sewing. I’d love to win this kit! I love Sprout options and have been happy to save up enough to get one of your preprinted patterns – now with the discount code! Thanks Colette!